The Machame route is a popular but challenging route up Mount Kilimanjaro. 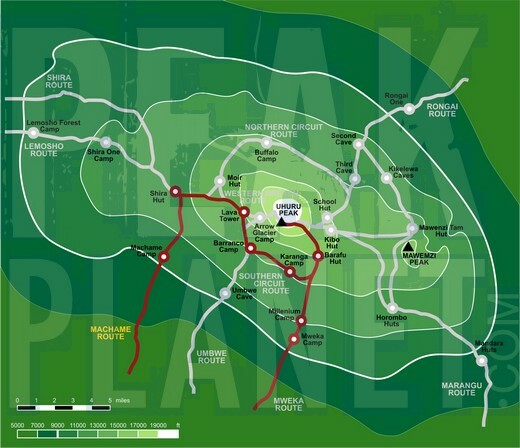 Known as the Whiskey Route, the Machame route begins at Machame gate and ascends north to the Shira Plateau. The route then traverses the southern side of the mountain before summiting from Barafu Hut. The descent is by Mweka. The Machame route is a good choice for those who want a difficult path with a reasonable acclimatization profile, and also does not mind crowds. The route costs less than other camping routes due to its short access drive and fewer days on the mountain. The Machame route measures 30 miles (49 km) in distance and takes 6-7 days total. Arrive anytime in Arusha, Tanzania. We soon leave the forest behind and enter the moorland zone of giant heather. The trail climbs steadily through rocky hills with wide views of the Shira Plateau. From our camp nearShira Hut (12,600 ft), we take in the unforgettable views of Mt. Meru as she floats among the clouds. A morning of sustained ascent and panoramic views brings us to lunch near Lava Tower(14,900 ft). The trail then descends to the bottom of the Barranco Valley (12,800 ft), where we stay in the spectacular Barranco Campsite sheltered by towering cliffs and with extensive views of the plains far below. We start our ascent by torchlight about 1 a.m. so that we can be up on the crater rim by sunrise. The steep climb over loose volcanic scree has some well-graded zig-zags and a slow but steady pace will take us to Stella Point (18,800 ft), in about five or six hours. We will rest there for a short time to enjoy the sunrise over Mawenzi. Those who are still feeling strong can make the two-hour round trip from here along the crater rim to Uhuru Peak(19,345 ft), passing close to the spectacular glaciers and ice cliffs that still occupy most of the summit area. The descent to Barafu is surprisingly fast, and after some refreshments, we continue to descend to reach our final campsite, Millenium Camp (12,500 ft). A sustained descent on a well constructed path takes us through a lovely tropical forest alive with birdsong and boasting lush undergrowth with considerable botanical interest. Our route winds down to the Kilimanjaro National Park gate at Mweka (5,400 ft); and on through coffee and banana farms to Mweka village, where we are transferred to Arusha. Climb Kilimanjaro on the Machame route.